Here’s 10 reasons to Ski Quebec…great skiing is just over the border, eh?! No pricey plane ticket or jet lag to experience the joie de vivre of a French ski trip. Drive to Quebec, and ski Le Massif and Mont Sainte Anne for a little European alpine ambiance. You can speak French, eat fondue, and ski the closest thing to a fjord as you descend the snowy slopes toward the St Lawrence River at these Quebec ski resorts. The Quebecois embrace winter – they celebrate the snow, cold, and ice with the world’s largest Winter Carnival the first two weeks of February. On your drive to Quebec’s skiing (6.5 hours from Boston if you drive like you ski), stay a night or two in Quebec City . This 400+ year old city sparkles with holiday lights, ice palaces, even winter parades. Cozy restaurants serve French cuisine in the fortified city, a short walk along snowy gaslight streets from the chic Hotel Le Germain Dominion, and a half hour drive to the ski slopes. Mont Sainte Anne offers skiing on three sides, a swift base to summit gondola among its four key lifts, and superb views of Quebec City and the St Lawrence Seaway. Long scenic FIS sanctioned trails like La Crete, relentless bumps on La S and La Super S, or exciting glades of “La Belle et La Bête” (Beauty and the Beast) – Mont Sainte Anne has it all plus plenty of big groomed blue boulevards. Mont Sainte Anne provides skiers 2,050′ vertical on 66 trails. The longest, Chemin du Roy, is 3.6 miles long. The kids will love skiing to the Cabane à Sucre, for maple sugar on snow served at a trailside chalet. Staying slopeside is très bien, especially if you wish to night ski on Mont Sainte Anne’s 19 lit trails or just send the kids skiing and watch them from a slopeside bar at après ski. Chateau Mont Sainte Anne is the only on-mountain hotel, 4-star and about 14 steps from the ski lockers to first gondola for first tracks. Ask for a newly renovated Nordik studio, hit the outdoor hot tub and indoor pool, then go for fondue at Le Brez. Le Massif, twenty minutes north of Mont Sainte Anne, makes my top 10 Eastern family ski resorts list for its modern lifts and amazing views of the St. Lawrence River, even more sensational than Mont Sainte Anne. It’s very cool to ski the 2,645′ vertical from the summit (start your ski day on top) down the banks of the St. Lawrence River – the scenery is more fantastic with every turn. Le Massif received a big splash of cash on the St Lawrence River, thanks to owner, Daniel Gauthier – of Cirque du Soleil fame and fortune. Two gondolas and three high speed quads cover this well-pitched, picture-perfect ski resort in Charlevoix- a Unesco World Heritage site. The Canadian Ski Team trains here on the triple black diamond Charlevoix trail which has a manmade peak to reach ski race sanctions. French cuisine at lunch in the scenic Summit Lodge is homemade local cuisine (no soda, burgers or chicken fingers served here – how about shrimp scampi or duck confit for lunch?) and skiing Le Massif’s 52 trails, try a serious sled ride – La Luge Le Massif. Go Rodeling on the only dedicated Luge trail in North America, the 3rd longest in the world, and it’s open to amateurs like me! You sit on a traditional wooden runner sled, called a Rodel in Europe, and slide down a 4.6 mile snowy trail with only your feet as brakes and your body as steering. It’s a crazy Canadian sport, wouldn’t fly in the safety-scared U.S., and it’s a deal for the downhill thrill at $35. I made it without crashing, more than I can say for the 20 others, but no one sledded without cracking up in laughter (or was that nervous giggling?). For ski and stay lodging at Le Massif, so ringmaster Gauthier has built a fantastic Hotel La Ferme in nearby Baie St Paul , where he grew up. This unique modern hotel complex features five themed lodging buildings, a grand lobby with an après ski lounge, and amazing dining in an elegant lofty open-concept kitchen. Rates are surprisingly affordable at “The Farm” translated, $199 for a swank suite that accommodates families nicely or $49 a night in the dormitory. Take the Ski Train to Hotel La Ferme – with its own hotel train station – skiers can ride Le Train along the St Lawrence River to the slopes and connect back to Quebec. After skiing, ice skate around the cool modern hotel’s exterior, or head to the full service Spa where three outdoor soaking tubs await – surrounded by snow for real European affect. 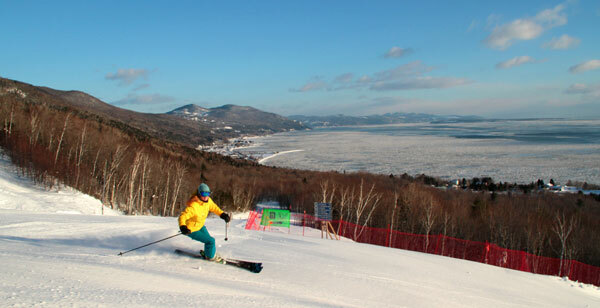 Tremblant is another world class ski resort in Quebec, an hour north of Montreal. This three sided ski mountain has modern lifts and over 100 ski trails, but the best amenity is the bustling European style ski village at the base with the most genuine après ski in North America. Did we mention the exchange rate?! It’s worth the drive north to discover the ski gems of Tremblant, Le Massif and Mont Sainte Anne, certainly cheaper than flying to the French Alps. Quebec has plenty of snow this season, your dollar is on par, and you can parlez Français for fun (think: piste, après-ski, bière, fromage, joie de vivre).